Has set me free, oh, what a love! God loves me so tremendously but He loves you just as much. What have you done with that love? he said he is very close to us more than even our cloths, he said we should always ask him to join us even with our house chores, he said he died that we might be free from the manacles of the devil, he said it is finished. the poem is one inspired by heaven! Thanks and remain blessed, Chinonyelum! So true, Thank you Jesus. sooo very true that while it can be great, human love has it's limits. to love and give your life for someone that may never even care for you... it's crazy just how much God loves us. Yes, Marie, His love for us is truly marvellous. Thanks, IE! You are blessed! Thank you, Demelza! God's grace in your endeavours. A love so everlasting. Thank you Lord for loving us wholly. Amen. And may we always have the good sense to love Him back. Bless you, Chidinma! Just like you said ma, human love has a limit. Some even love you for a purpose, mostly to take advantage of you. But God's love lives and is forever. The book of Isaiah tells us about the Lord's promise to his children, it talks about how he will never forget or abandon us, even though a mother may forget her newly born. Yes, when I look upon the cross on which Jesus Christ our Savior is crucified, I look not only on His Crucifixion but the cross signifies God's Prodigal love for me and the extent to which He could go . 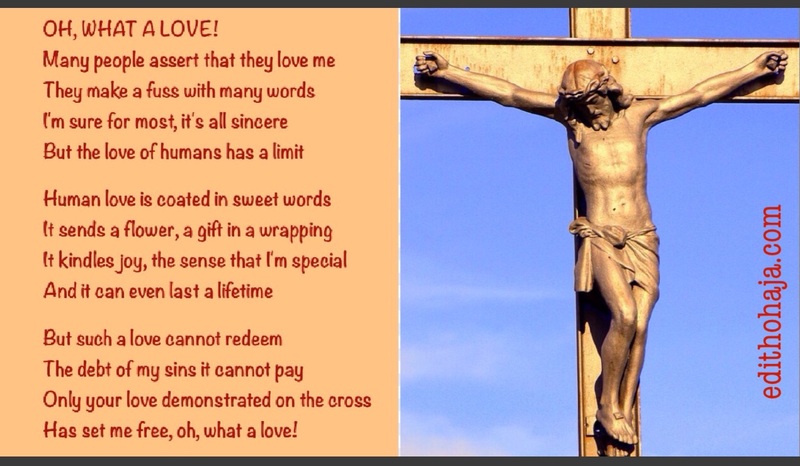 No greater love than the love of Jesus. so broke that i couldnt pay for my sins, but he came and redeemed me. oh! what manner of love. An unconditional. He loved me first, He paid the price... reflecting on the song we do sing in Church... "Anwurum nihi gi, gini ka gi merem?" (i died for you, what have you done for me?) its a question we need to ask ourselves. Gods love is the greatest,the love that never fails. Human being might claim to love you but when problem arises, the are no where to be found. In other case you might even give your love to a human and he/she might not even notice or care to love you back.. this is true ma God's love is the greatest. The love of God is unflinching and unwavering, it stresses through diverse depths and heights. It surpasses the love of humans which may only last for a period of time. which other love is greater? but that God sent his only begotten son to die on the cross for me, for you, for all of us and generations yet unborn OH, WHAT A LOVE!